Cantilever and v-brake systems are compatible with any frame and fork fitted with suitable bosses. 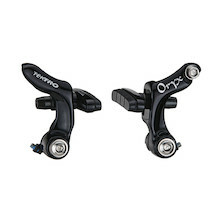 They are interchangeable systems, but due to different pull ratios you may only combine a v-brake lever with a v-brake caliper, and the same for cantis. Cantilever brakes offer one big advantage, and that's mud clearance. Until disc brakes were recently legally introduced, the sport of cyclocross bike racing exclusively relied on the stopping power of cantilever brakes- and in the wet and mud of those winter off road circuits that speaks volumes about their capabilities. 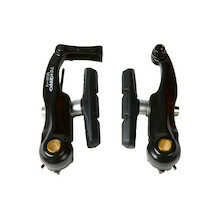 V-brakes are fitted to many lower and mid-priced MTB's, urban bikes, and tourers; and offer a very capable performance when used with a good quality, short reach brake lever.